Anyone else who has a great interest in economics might share a bit of joy with me when looking at prices for winter flights between the northeastern US and Florida. It’s a strange thing, but flights seem like they are actually even cheaper during other times of the year, which is exactly the opposite of what you’d expect. In almost every other case, the higher demand seasons have the highest airfares too. For example, everyone wants to go to Europe during summer, and prices are on average almost twice as high during July compared to February. Even though labor prices and fuel prices are the same most of the year, airlines are able to raise fares by great margins during the high season. So it’s a bit amazing that high season in Florida seems to have very low prices, and this happens every year. Right now you can fly round-trip from New York to Fort Lauderdale for only $150. That same distance trip anywhere in the western part of the United States would cost close to double that, so it’s really a bargain at any time of year. Even though Fort Lauderdale Airport is very close to Miami, those wanting to save those last 30 miles on the ground can fly round-trip from NY to Miami for only $210. Or want to go to a theme park instead of the beach? Fly from NY to Orlando for only $200 during the height of the winter season. From Washington DC to Fort Lauderdale it’s as low as $130 round-trip, and to Miami it’s only $160, with Orlando only being $170. From Boston you can fly nonstop to Fort Lauderdale for as little as $130 round-trip, and to Orlando for only $200. Miami starts at $240 from Boston, and for that extra $100 you are better off hiring a taxi, or even a limo, once you land in Fort Lauderdale because the fare will still save you money. Flights during the Christmas and New Years holidays were obviously full and quite expensive, but those of us who stay closer to home can get excellent deals starting as early as the 4th of January and running through the entire rest of the season. 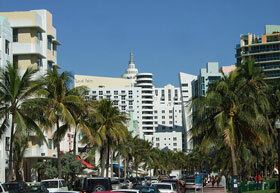 It’s true that Miami is quite expensive, and Key West is even more expensive, but if you go up the coast or even over to the Gulf side you can find hotels with far lower prices in winter, and the same excellent weather that will make you forget the snow piling up on your car in the long-term lot back home.